My father completed his studies for Medicine at Sydney University on 19 December 1958. His graduation day was 28 January 1959. 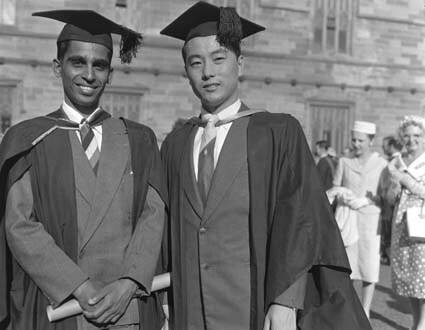 Here is a photo of him on the 28th of January 1959 at Sydney University standing on the right with Dr Sivalingam Sinnathamby, of Rantau, Negri Sembilan. Next Post:Who do you think you are?